Act 2 cast performs the final production they prepared for. 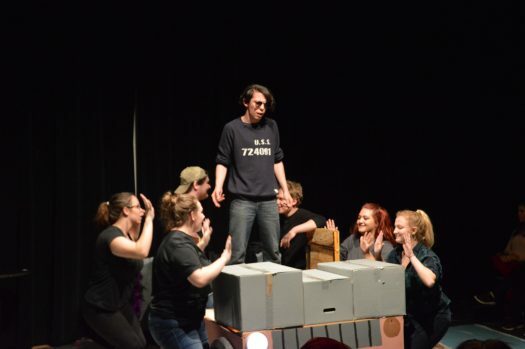 Tech Week, also referred to as “Hell Week”, was a highly stressful time for the cast of Mr. Burns A Post Electric Play who were under the pressure of many waiting to see the final product of their hard work and effort. The essence of time was not on the side of the performers. Even though they wanted the play to go on, they were falling short of the time they needed to really prepare the finalized product. Also right around the corner there was another huge obstacle for the students to overcome. “Mainly the biggest obstacles were in costuming and having a bunch of drama went down in Tech class and one of the set leads quit so we kind of lost a lot there,” said Jesse Espinosa (Actor, Costume Design, Set Design). After some deeper research into what took place to make one of the set leads quit, it was discovered that the student transferred schools completely. With this serious setback for the cast, they still pushed forward and persevered to make this play a reality for them all. Espinosa explained a couple things he participated in to help out. “Working very hard, I did literally everything, I also was apart of Tech, I designed my own costume, pretty much memorized my lines, etc.” said Espinosa. The cast appeared to act like an actual family through the ways they helped each other, even when it would have been easy not to at all. Even through the reality of the stress, they committed themselves to their passion, but there was always the rough days ahead. Even with all the frustrations that never gave the members a second to catch a breath, they pushed forward and came up with a resolution in the end to replace the mask. All hands were on deck to help each other perfect any and all details they could in their short amount of time given. Finally the performing cast got some backup in their efforts to rise above the challenges every time. “…there’s been a lot of new people who have been adapting very well actually. They have been doing a good job”, said Espinosa. With the new student performers coming in to relieve some stress, the original crew started to relax. Even the director, Lauren Wasser enjoyed watching her students hard work pay off with a magnificent outcome. “I’m always having fun…”, said Wasser. Overall the struggles the student performers persevered through to create a play that was precise, on point, and amazing!